View Proposed clearcut near pending expansion of protected wilderness area sparks concern by Emma Smith, CBC News Oct 09, 2017. Chris Miller of the Canadian Parks and Wilderness Society “wrote a letter to DNR in July asking the department not to approve the proposed harvests because of the potential impact on the Tobeatic’s ecosystem, which includes more than 100 lakes and habitat for several endangered species. Miller says he’s yet to receive a response. He wants the province to have a more informed plan for how it makes decisions on proposed cuts near protected areas. “The concern is that this is happening sort of haphazardly, that there’s no plan in place for it that deals with the particular impacts on the protected areas themselves,” he said. 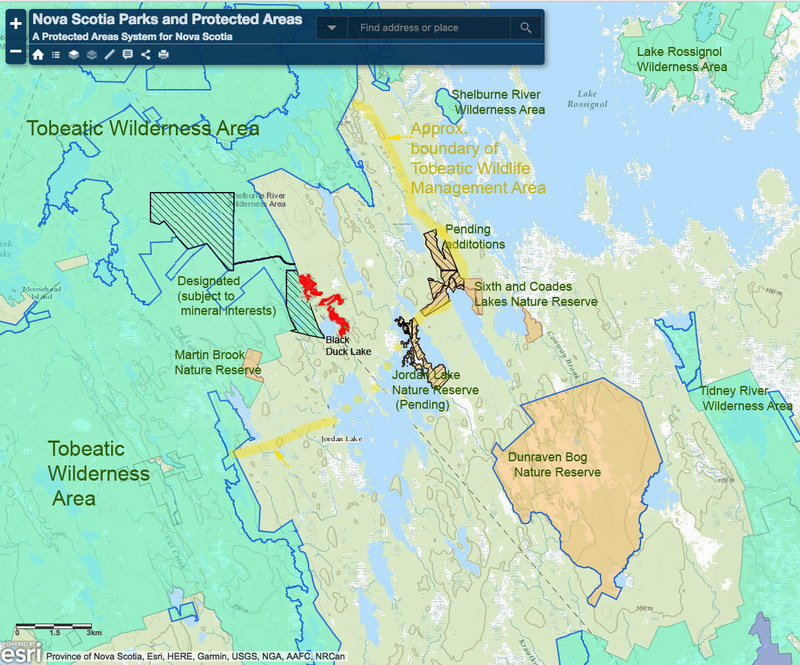 Map showing Protected Areas, Nature Reserves and approx. boundary for the Tobeatic Wildlife Management Area. 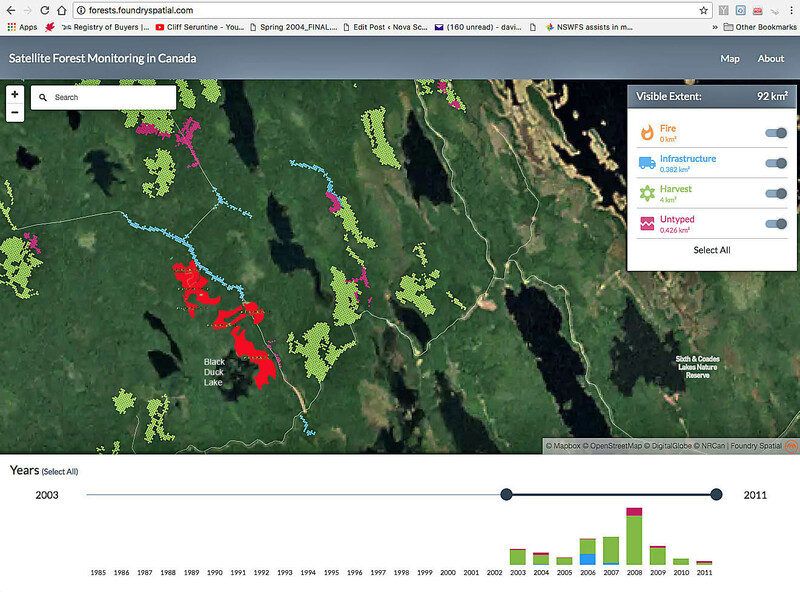 Map modified from Nova Scotia Parks and Protected Areas Interactive Map; red patches are the proposed cuts. That makes the harvest sound pretty trivial – 20 ha against 500,000 protected. What the Harvest Plan Map Viewer (HPMV) does not show is the location within the Tobeatic Wildlife Management Area immediately next to a designated addition to the Tobeatic Wilderness Area – see map at left. Canadian Forest Service/UBC/Canadian Space Agency Satellite Forest Monitoring map showing harvest 2002-2011 in the Black Duck lake Area. The red patches are the proposed crown land harvests (inserted). Reference to the Global Forest Watch Interactive Map indicates there was not much cutting 2011-2015. The combination of a location close to several Protected Areas (including Nature Reserves) and previous cutting – not to mention future cutting – should trigger concerns about buffer zones and connectivity and be enough to require selection cutting for any harvest in this area. In fact, “Partial Harvest – Individual Tree Selection” is proposed for three (total 59.7 ha) of the five separately identified blocks identified for havesting; one additional block of 9.98 ha is identified as “Partial Harvest- Uniform Shelterwood” (classified as a clearcut in the federal system). Only one block is identified as “Clearcut- Overstory Removal” (20.2 ha) which I gather is the second stage in a shelterwood cut, so the newly proposed shelterwood cut will likely go the same way, making 30 ha of clearcut in total. I am guessing that the rationale for these clearcuts is that the stands are ‘not suitable for selection cuts’ according to NSDNR criteria, but there is another option: NO CUT! Unfortunately, this story is a repeating one, circumstances being almost identical to those related to clearcuts on Crown land close to the pending Shingle Lake Nature Reserve, not far away. Both underscore the apparent lack of landscape level planning for biodiversity conservation in Crown land harvest decisions. 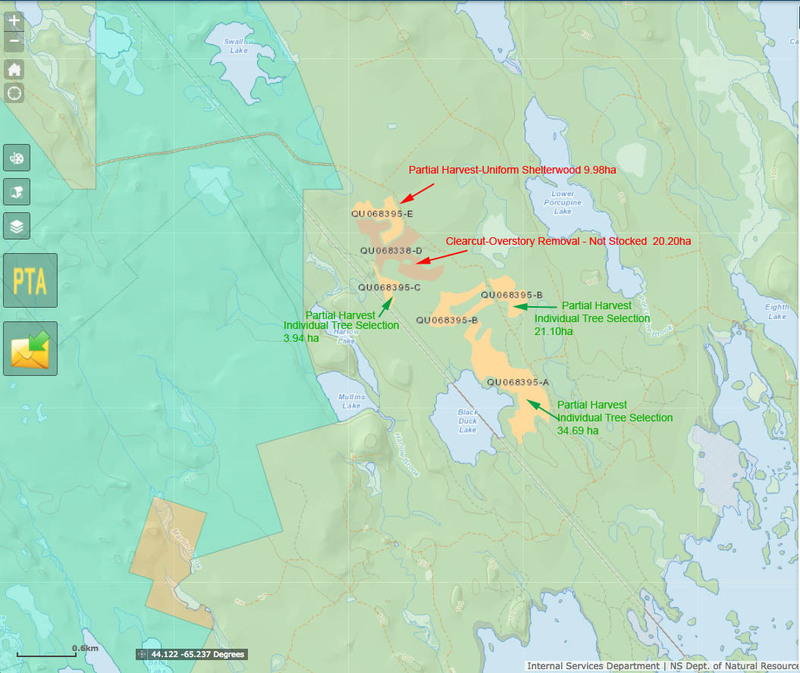 Clearcut Nova Scotia, continued..12June 2017 Post, June 17, 2017 – Margaree River Watershed Protected Area and the Ruiss Noir Protected Area. 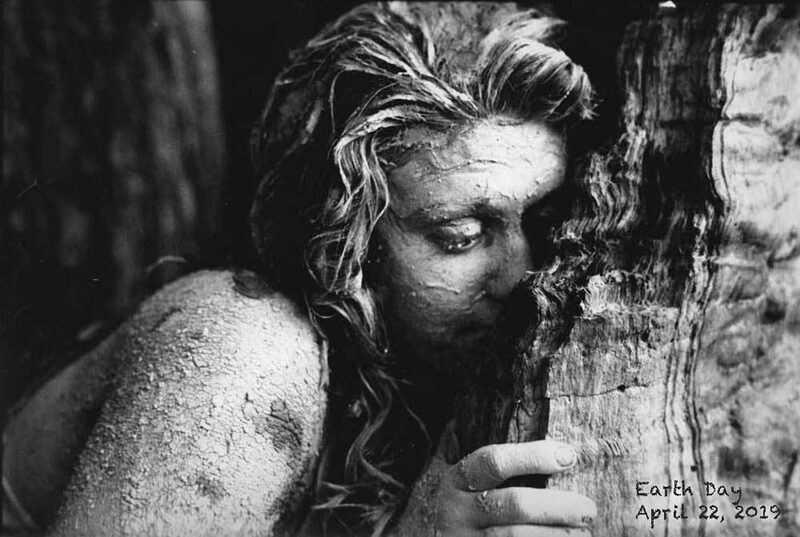 NS Environment. From the plan, page 20: “Management activities will be reported at an annual workshop and public information session, hosted by Nova Scotia Environment and Labour. The purpose of this annual event is to review activities, advise of anticipated projects, and identify emerging priority actions.” I wonder when this last happened. This entry was posted in Acadian Forest, clearcuts, Parks & Protected Areas, Show Us the Science. Bookmark the permalink.